After collecting these Orts for a year I thought I would share with you what I did to make orts fabric. Dissolvable fabric looks like plastic and is sometimes called wash away stabilizer or Water-Soluble Vilene is used to make freeform non woven material. Some brand names are Dissolve, Solvy, Aqua Film, Rinseaway. In this example I am using the wash away hospital bags as water soluble stabilizer. With all these products the principal is the same. 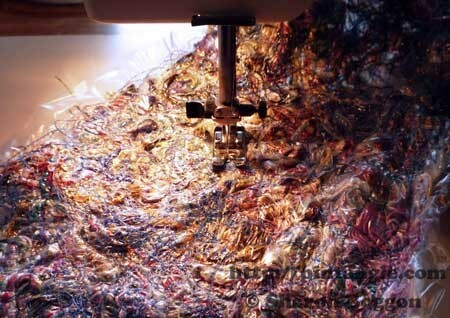 You stitch on the product then wash it away and are left with only the thread you stitched. Some really lovely work is created using this technique. 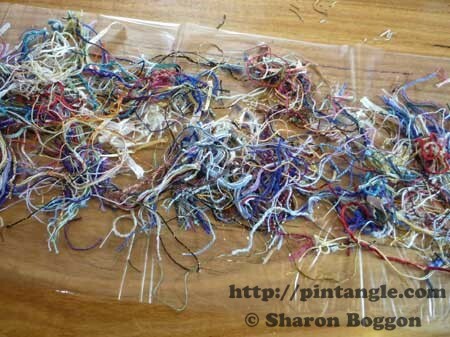 You can make little samples and join them together or do what I did which is to make a larger piece. 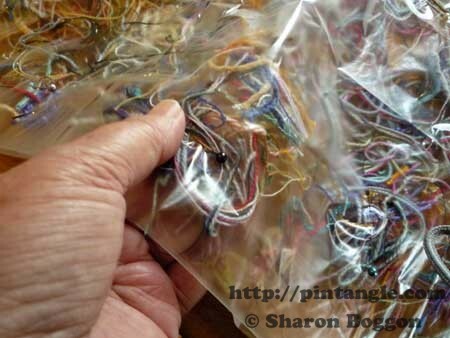 With this technique you can not only use up your orts but you can use embroidery threads, wool, textured yarns, silk bbon ends and tiny scrap fabric. Take a piece of dissolvable fabric and lay the threads evenly as possible but look for interesting combinations of colour and texture. Place the other piece of dissolvable fabric on top so that you have a sandwich with the threads in the middle. Pin it well. I sew around the edge to create a pocket. This stopped bits falling out of the sandwich as you work! 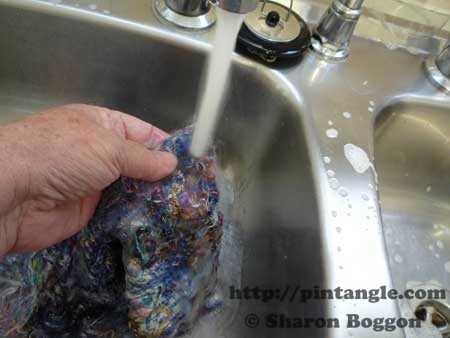 Sew over the top of the dissolvable fabric in a freeform net like pattern. This stitching will trap the threads. I used different coloured thread and added some metallic threads. Wash well under cold water and the dissolvable fabric will disappear, leaving just your sewn threads. Iron this dry under baking paper. If it is a little stiff you have not washed out all the dissolvable fabric. Wash it again. I could make a scarf from this. 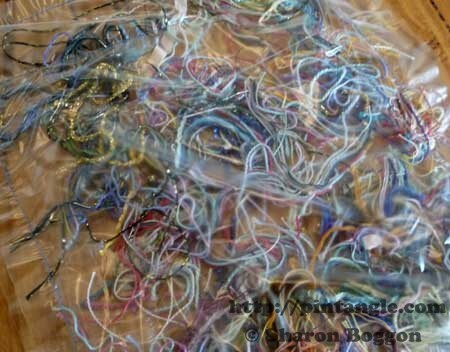 The photograph does not quite do it justice as there is metallic threads and silk ribbon scraps in it. It has far more life in it. I think I will treat it like a fabric and feature small pieces of it in works that can be beaded and embroidered. Anyway that is what I did with my Orts. 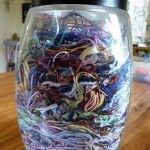 I now have an empty jar ready and waiting for next year! 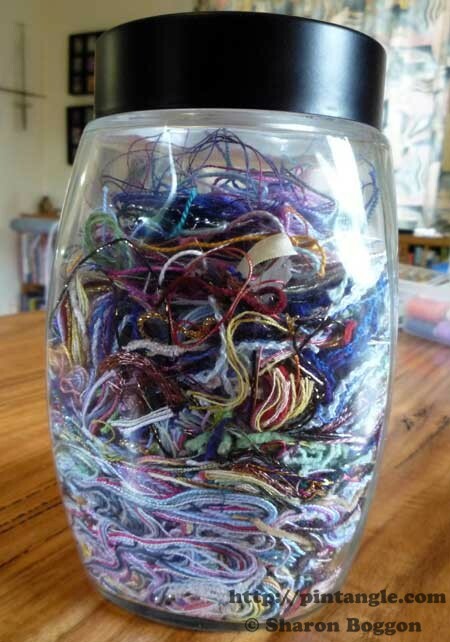 Now I can use all the old thread that my sewing repair person says to throw away. I can just up cycle it to creating my own fabric. What fun. This is a fabulous idea I can’t wait to try it out you have given me some great ideas in creating wonderful scarf patterns. Thank you. I use this technique for making small pieces to add to my designs.Washing the stuff out is gross!!!! !I have a not very complementary name for the wash out material….think of dirty hankies! !But its fabulous for adding something different. FYI if you dont wash all the fabric out it gives the finished piece more substance .. like starch! Now this is COOL! Love it! I don't think dissolvable fabric is available in my country,got to find out an online source. Not sure where you are but if there are any sewing machine dealers selling embroidery machines they should have it. It is sold under some of these names for reference: Aquasolvy, Solvy, Aquamesh. It comes in a few types as well. Some of it looks like plastic wrap and some looks like paper towel and there are different thicknesses too. The material is made out of starch so it washes away. Wow! The possibilities are endless! Thanks for the great idea. Thanks for visiting my blog Sharon and for your lovely comment. I've been having fun experimenting with these blocks. I frequently review my notes from your CQ class from a few years back which are very helpful with design challenges. Thank you Sharon for this tutorial. Now I know what to do with "unusable" leftovers. Want to try it too. Just have to find melt away material. Wow, that is fantastic!!! A wonderful, artistic way to use up the ORTS. I've used my Orts in fabric postcards and ATC's, beneath a layer of organza fabric, to add a lively background. It's fun. Do you lay the organza fabric over the SOLVY water soluble sheets. I want to make organza scarfs. This is wonderful. Thank you for sharing the how-to. I'm not sure what the 'hospital bags' are but I have a water soluable material I was going to experiment with. 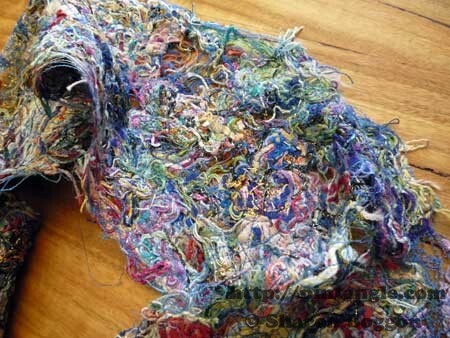 The colors and fibers in your piece are beautiful. I have so much to learn. I have been away from sewing for probably 30 years (until this past year) and I'm constantly amazed at all the new products available.